Old Ebenezer Scrooge is a cruel man for whom life's only passion has become only money; he hates Christmas, even the very mention of it, lives alone and only to work. He is very strict with his only, underpaid and overworked, employee, Bob Cratchit, and does not believe in giving away to charity or being kind to anyone. One Christmas Eve, Ebenezer Scrooge receives a ghostly visit from his long deceased partner Jacob Marley, who had died exactly seven years before on that same day. In his life, Jacob Marley had been just as selfish and uncaring as Scrooge was now. He tells Ebenezer about how his soul has not had a moment's rest since his death and how his spirit has been doomed to wander the earth looking down at what might have been, had he been a different man. He tells Scrooge that he wants to spare him that same fate, and that on that night, he will receive the visits of three spirits. After Jacob departs, Scrooge heads for his bed with no intention of having his sleep be interrupted by anyone. Still, precisely as Jacob Marley had predicted, the first spirit, the Ghost of Christmas Past arrives at one o'clock. He and Scrooge depart together for the Christmases that have already been, and from the experience, Scrooge gains a painful memory of the person he was, and how he became what he is today. The second spirit, the Ghost of Christmas Present, shares with Scrooge the Christmases being celebrated on that same year, especially the merriment being had at his nephew Fred's home; Fred had invited him to dinner, and Scrooge, as usual, had declined the invitation. From this experience, Scrooge also learns about Bob Cratchit's family, and how his youngest son, Tiny Tim, is a fragile creature supported by a crutch who may be doomed to die unless he receives better nourishment, more than his father can provide. 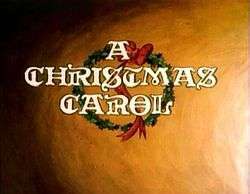 Finally, Scrooge receives the last of the visits, from the Ghost of Christmas Yet to Come, and Scrooge finds himself a changed man after he learns of the cruel fate in store for Tiny Tim, as well as the even crueler fate reserved for himself. Tiny Tim will die and be mourned by his loving family, while Ebenezer Scrooge will die alone, being no one's concern. Spared by the spirit, Ebenezer Scrooge wakes up on Christmas Day determined to keep the promise he had made to the spirits the night before, and before setting off to accept his nephew's invitation and join them for dinner, he has a priced turkey delivered to Mr. Cratchit's door. From that day, no one in London knows how to celebrate the Christmas spirit better than Ebenezer Scrooge, and Tiny Tim could wish for no more caring a friend. ↑ "Release dates for A Christmas Carol". The Internet Movie Database. Retrieved 21 March 2008.